A young man and woman meet, love each other, and are consumed. It’s a story as old as romance itself, but in this enthralling novel John Burnham Schwartz tells it with heart-stopping new immediacy. In the middle of a rainstorm Julian Rose, a self-effacing Harvard graduate student, takes refuge beneath a girl’s yellow umbrella. 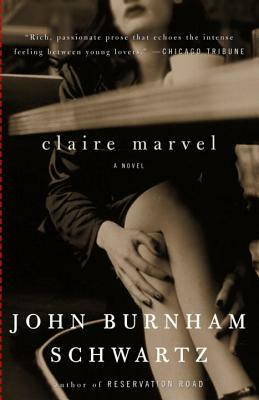 The girl, the woman, is Claire Marvel, lovely, mercurial, mired in family tragedy. She is the last person someone like Julian should fall in love with. But he does. What ensues is a great and difficult passion strewn with obstacles–not least those arising from Claire and Julian’s disparate characters. And as these young people find and lose each other, then seek each other anew, Schwartz places romantic love within an entire continuum of attachments that require the full reserves of our openness and courage. John Burnham Schwartz is the author of Bicycle Days and Reservation Road, which have been translated into more than ten languages. His writing has appeared in numerous publications, including The New York Times, The New Yorker, The Boston Globe, and Vogue. He lives with his wife, filmmaker Aleksandra Crapanzano, in Brooklyn, New York.